Inquiring about suggestions for my next dive, Paul Shepherd @ Seminole Scuba had floated the idea of a forthcoming shark dive down in West Palm Beach, Florida in mid-January. For some odd reason, I was enamored by this thrilling prospect of viewing these animals while diving. I hadn’t voyaged into the water with a shark since seeing one back in the Bahamas as a teenager. One of the requirements for this dive boat excursion was taking the Padi Advance Open Water class. In lieu of Advance Open Water class and Nitrox training, Jim Abernethy’s Scuba Adventures had offered an introduction to Nitrox. Nitrox for the uninitiated was a different mix of oxygen to nitrogen. Standard air cylinders carry 21% oxygen, a Nitrox cylinder had normally ranged from 32% to 34% oxygen with some variation. This increased oxygen formulation had enabled longer dive times, less fatigue and shorter surface intervals. One important downside for Nitrox was possibility of oxygen toxicity at certain depths. Hitting the open waters on the charter boat Wet Temptations, the congregation of divers had started gearing up while receiving our pre dive briefing. The first new check on this adventure was learning how to verify the Nitrox mix. This process had sounded easier than done with the boat bouncing up and down in the surf. Looking back at stats from my Suunto Viper-Air dive computer, I had lost anywhere from 300 to 500 psi across different cylinders learning to get a readout. With 15 minutes until drop off, the crew had thoughtfully reminded us to get ready our BCDs and regulators. 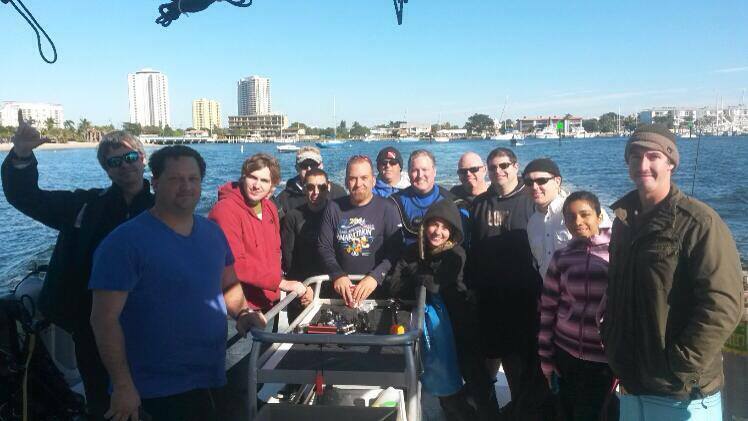 The inexperience of being on my first dive boat was exhilarating with the call of “Dive! Dive! Dive!” Descending on the first of three dives, I had approached around 85 feet in depth. Right out of the gate, I was treated to sights of a turtle, a wreck, a stoic barracuda and a fleeting bull shark. Despite any previous apprehension of sharks, the event was extremely serene. The big excitement for myself was on ascending in the water column. Taking the 15 foot safety stop, I had run low on air consumption. Additionally, I had struggled with getting caught in my reel line for my safety sausage while climbing back onto the boat. Before arriving at our next dive spot, the wind had placed a chill across my body generating hypothermia. Luckily, the vessel had a hot water hose and snacks for mediation of the surface winds. The second dive was equally calming with a bounty of lemon sharks. Now, what I had come to discover lemon sharks really don’t pose much of threat to humans. They had tended to go for smaller prey (i.e. parrot fish etc..), specifically for the probability of success. Watching the various approaches of lemon sharks, they had seemed curious but, equally cautious. At no time had I felt any sensation of being threatened. 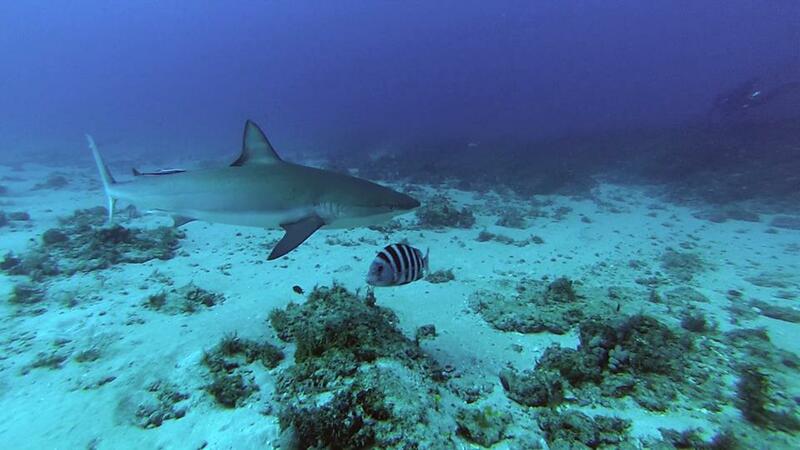 On the third dive, we had seen a few more lemon sharks coming into proximity of a reef. The same emotional refrain had repeated. The importance of this dive was having a new appreciation for this misunderstood seafaring creature. Despite that new perspective, I had still garnered a healthy respect for sharks in their natural habitat. After all, I was only a surface dwelling mammal. This was without question, one of the most enthralling experiences of my life. To that end, I had wanted to say thanks again to Paul Shepherd @ Seminole Scuba for another fracking great recommendation and a shout out to the attentive crew from Jim Abernethy’s Scuba Adventures. Now can someone get me another breath of Nitrox! This entry was posted in Travel and tagged Lemon Sharks, Nitrox, Scuba Diving, Sharks, Wreck. Bookmark the permalink. Across the Universe Happy Valentine’s Day Mom!